Healthcare institutions deposit over 250 million pounds of drugs into the sewer system each year in the United States. In September 2014, the U.S. Drug Enforcement Agency (DEA) instituted a chemical destruction process requirement prior to disposal to prevent pharmaceutical waste from ending up in drinking water. The current acceptable means of disposing of these substances is through incineration or sewering after chemical destruction. Due to this new regulation and increasing concerns around theft of unused narcotics, pharmaceutical waste management has become a significant operational cost and logistics challenge to healthcare organizations. 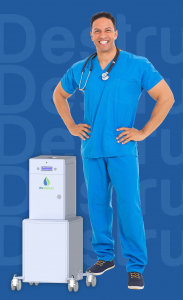 Clear River Enviro (CRE) has developed a proprietary technology used to destroy unused pharmaceuticals. 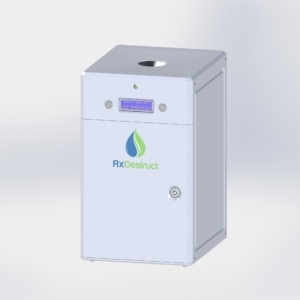 The product, RxDestruct, implements a chemical process to break down the compounds in pharmaceutical waste to a liquid product that can then be safely disposed into the sewer system. This new scientific approach to treating chemical compounds that can be done in a device the size of a desktop printer. 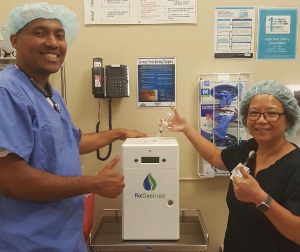 The size and configuration of RxDestruct allows for installation anywhere pharmaceuticals are handled, and can be directly installed in-line with standard plumbing connections allowing for immediate disposal into the sewer following chemical destruction. CRE’s innovative solution will bring to market the lowest-cost product available for pharmaceutical destruction while improving compliance with the DEA and EPA regulations.